As a caring and compassionate member of our community, The Stationery Studio is proud to reach out and lend a helping hand. The following are some of the worthy causes we support. We encourage everyone to find their own special causes and projects to transform lives and make our world a better place. Red Nose Day is a campaign dedicated to raising money for children and young people living in poverty by simply having fun and making people laugh. The inaugural Red Nose Day was held in the US on May 21st, 2015. Through the support and interest of our fans we raised $1,000. Money raised through Red Nose Day goes to The Red Nose Day Fund, a program of Comic Relief Inc., a U.S. 501(c)3, public charity. To find out more, visit RedNoseDay.org. For #GivingTuesday, The Stationery Studio participated by donating 5% of every purchase to donate to our local food pantry. The holiday season is often a time when food pantries are at their lowest and really in need and we were excited and honored to be a part of #GivingTuesday because it’s something at the core of our personal values. To find our more, visit GivingTuesday.org. The Stationery Studio found a great way to join so many people in this fun way to raise money and awareness for this dibillitating disease. For every social media "like" we got for our ice bucket video we contributed money for a total donation of $3,600. To find out more, visit www.ALSA.org. The Stationery Studio setup a collection box in their office building and collected over 100 coats for One Warm Coat, a charity whose mission is to "provide anyone in need with a warm coat, free of charge". These coats were delivered locally to Journeys the Road Home who provide shelter, services and housing to those who are homeless. For more information, please visit OneWarmCoat.org. 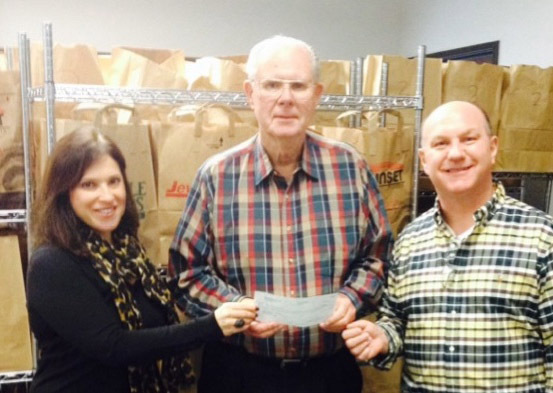 The Stationery Studio donates every year to the Vernon Township Food Pantry to help those in need in their community. The Vernon Township Food Pantry said the money donated helps to provide for over 140 families who are in need. William Peterson, Vernon Township Supervisor, was there to accept the donation from The Stationery Studio owners Marc and Renee Redman. "We truly appreciate this monetary donation," said Peterson. "We were able to help all the families in the area this year."